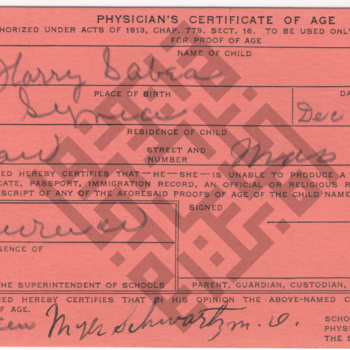 A physician's certificate of age for Harry Sabea, born December 1897. A certificate in Turkish. ID certificate/record, year of birth 1897. An English notation at the bottom reads "Annie O Hannian born 7-April 1899"
An Arabic letter handwritten by Father Khouri Elias (last name not clear) on January 8, 1914. It confirms the baptism of Abduallah son of Naoum Yezbek on January 3, 1897. An Arabic letter handwritten by Father Khouri David Hajjar on March 15, 1913. Confirm baptism of Martha the daughter of Massoud Njaimeh on March 2, 1897. A physician's certificate of age for Adele Hassan Naoum, born March 21, 1897, listing her residence as Elm St.
An Arabic letter handwritten by FR. Basile Nahas on March 4, 1914. It confirms the birthdate of (name not clear) the daughter of George Francis on March 20, 1897. Arabic letter handwritten by Father Khouri Youssed Mansour Al Qizzi on January 28, 1913. It confirms the birthdate of Eskander Youssef Shaheen AlKhouri as November 1, 1897. This is record is a certificate certifying that Ayda Arrajj is older than sixteen years of age. It lists Ayda's date of birth as April 5, 1897 and was signed by M. Schawrtz, M.D. It also shows Ayda's address as 2 Bennington St.